Thanks for coming back to me on that Calum. I might make some time next time I'm up over to take in some WWI sights/sites. I like your point, corny though it may be, about remembering their sacrifice. I'd be happy to hear about the Normandy side of the trip too, if only to compare notes. I'm in the process of putting the whole trip together in a blog (I'll just be cutting and pasting the stuff from this trhead when I get to it) Once I've finished I'll post the link, but that'll probably be a Christmas job. The ruin of the Gibraltar blockhouse, taken from the Germans when the Australian 1st Division attacked, took and held Pozières village between 23 and 26 July 1916. This action was one of the many battles between 1 July and 19 November of that year known collectively as The Battle of the Somme. Gibraltar, like the Rock of Gibraltar, stuck out above the landscape, a landscape which by the end of July 1916 was a wilderness of craters. Lance Corporal Roger Morgan, 2nd Australian Infantry Battalion, described the scene: ‘a land of desolation ... villages are mere heaps of brick dust ... every yard of earth has been torn about by shells ... the whole place looks like a badly ploughed field’. This ploughing was done by thousands of British, Australian and German shells as the village and its surroundings were fought over, again and again, during July and August 1916. The concrete covered the entrance to a large cellar and a stairway led down to an even deeper room. On the way to Thiepval we drove past Mouquet Farm, called Moo Cow Farm by the AIF. 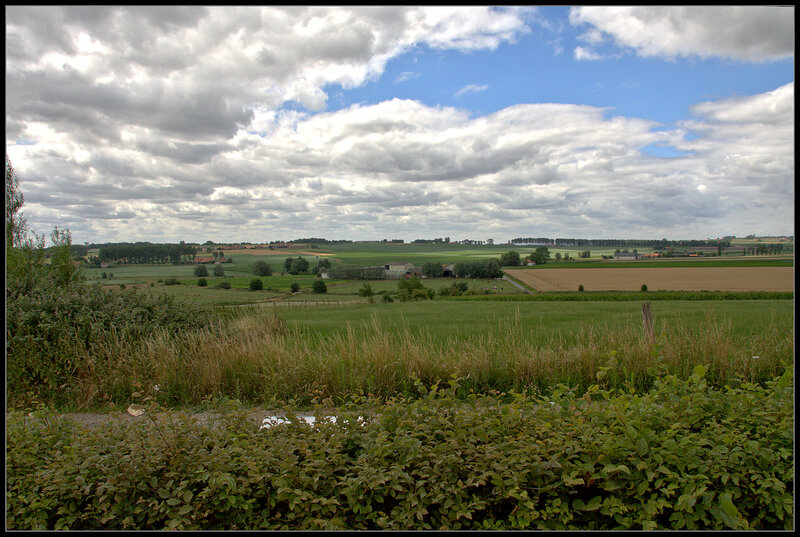 The Battle of Mouquet Farm, also known as the Fighting for Mouquet Farm was part of the Battle of the Somme and took place as part of the Battle of Pozières (23 July – 3 September). The Fighting for Mouquet Farm began on 10 August with attacks by the I Anzac Corps and it was captured by the 3rd Canadian Division of the Canadian Corps on 16 September. The farm was lost to a German counter-attack, before being re-captured on 26 September, during an attack by the 11th (Northern) Division as part of the Battle of Thiepval Ridge (26–28 September), in which No. 16 Section of the 6th East Yorkshire (Pioneers), smoked out the last German defenders. The memorial was under renovation for the 100th anniversary in 2016, plus they were building an expansion to the vistors centre. Another view of the inside. So many names. When they find or identify someone they are buried in a known grave then the name is removed from the memorial. No relation to me but so many Gibson's from one Regiment (the Northumberland Fusiliers) . You have to assume many of them are related. Where there were people with the same initial their service number is listed. About 5 mins drive from Thiepval is the The Ulster Memorial Tower. This is a Somme battlefield memorial to the men of the 36th (Ulster) Division. It commemorates the heavy losses suffered by 36th Division on 1st July 1916, the first day of the Battle of the Somme. There is a small museum and shop on site. The Beaumont-Hamel Newfoundland Memorial is a memorial site in France dedicated to the commemoration of Dominion of Newfoundland forces members who were killed during World War I. 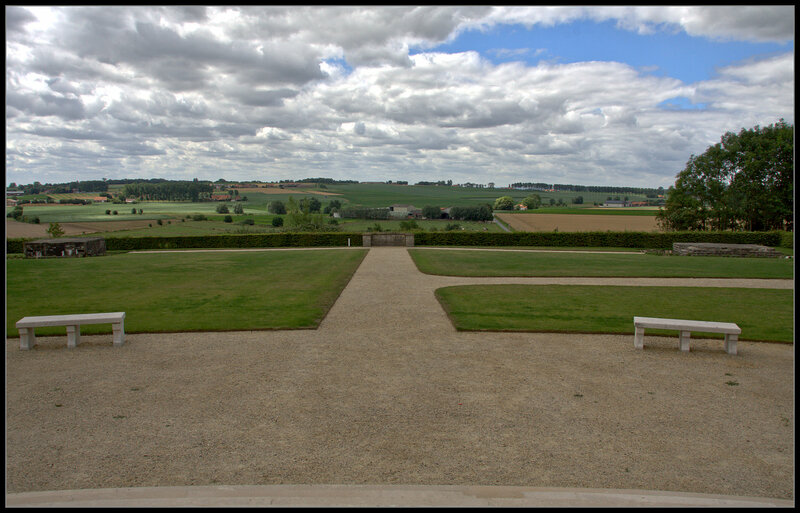 The 74-acre (300,000 m2) preserved battlefield park encompasses the grounds over which the Newfoundland Regiment made their unsuccessful attack on 1 July 1916 during the first day of the Battle of the Somme. The Battle of the Somme was the regiment's first major engagement, and during an assault that lasted approximately 30 minutes the regiment was all but wiped out. Purchased in 1921 by the people of Newfoundland, the memorial site is the largest battalion memorial on the Western Front, and the largest area of the Somme battlefield that has been preserved. Along with preserved trench lines, there are a number of memorials and cemeteries contained within the site. Officially opened by British Field Marshal Earl Haig in 1925, the memorial site is one of only two National Historic Sites of Canada located outside of Canada. (The other is the Canadian National Vimy Memorial). The memorial site and experience of the Newfoundland Regiment at Beaumont-Hamel has come to represent the Newfoundland First World War experience. As a result, it has become a Newfoundland symbol of sacrifice and a source of identity. The park does, nevertheless, preserve the memory of the men of the many other regiments from the French, British and German Armies who fought and died on this part of the Somme battleground from September 1914 into 1918. 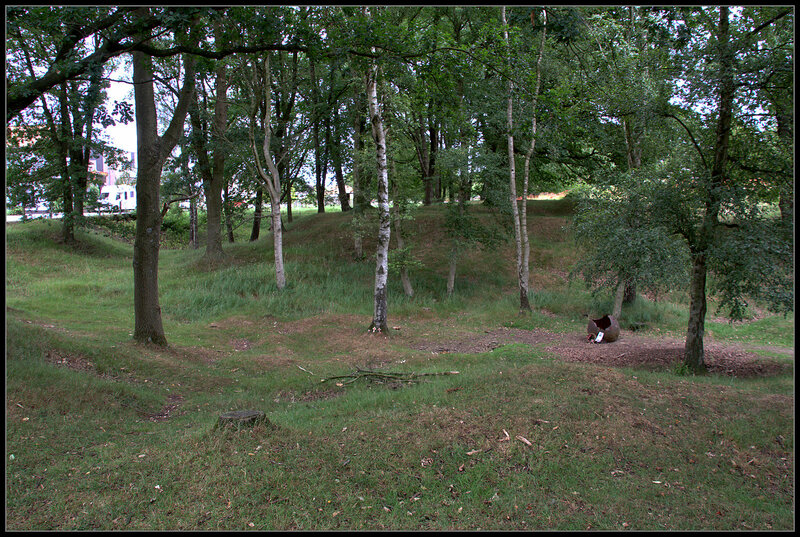 Remanants of trenches and a dugout with the visitor centre in the background. The memorial is one of six memorials erected by the Government of Newfoundland following the First World War. Five were erected in France and Belgium] and the sixth at Bowring Park in St. John's, Newfoundland, Canada.At the Beaumont-Hamel Newfoundland Memorial site the mound rises approximately 50 feet (15 m) from ground level. The mounds are also surrounded by native Newfoundland plants. Within the Park are three British Cemeteries (those of Hawthorn Ridge No. 2, "Y" Ravine and Hunter's). This is Y" Ravine. This cemetery was started in the spring of 1917 by the British V Corps and was originally called Y Ravine Cemetery No. 1. By that time the British Front Line had moved further east beyond the 1st July 1916 battle lines so it was possible to retrieve and bury soldiers who had been lying in this area for the best part of a year. There are over 400 casualties commemorated in this cemetery, many of which are unidentified. There are 275 identified burials in the cemetery. There are also 53 individuals from the United Kingdom and 8 individuals from Newfoundland named on memorials in the cemetery who are believed to be buried in this site among the unidentified graves. Overlooking Y Ravine is the memorial to 51st (Highland) Division. 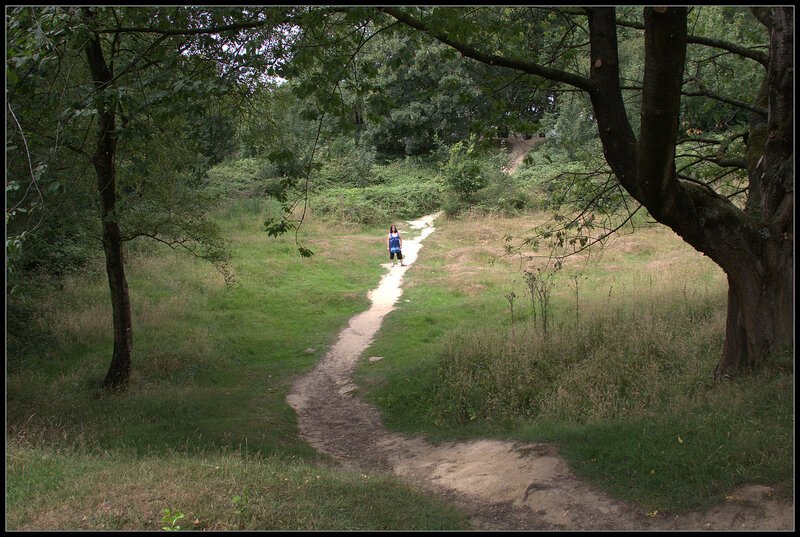 The Y ravine had been the scene of fierce fighting for the division on 13 November 1916. The cemetery is a large shell hole, in which soldiers of the 51st (Highland) Division and the 63rd Royal Naval Division were buried after the attack on Beaumont Hamel in November 1916. There are over 40 British casualties buried in this site. This is Hawthorn Ridge No. 2 cemetery. It was originally made in the spring of 1917 by the British V Corps (and named V Corps Cemetery No. 12). There are 200 graves in the cemetery, most of which are for soldiers killed in this location on 1st July 1916. There are 149 identified burials and over 50 of the remaining graves are unidentified. 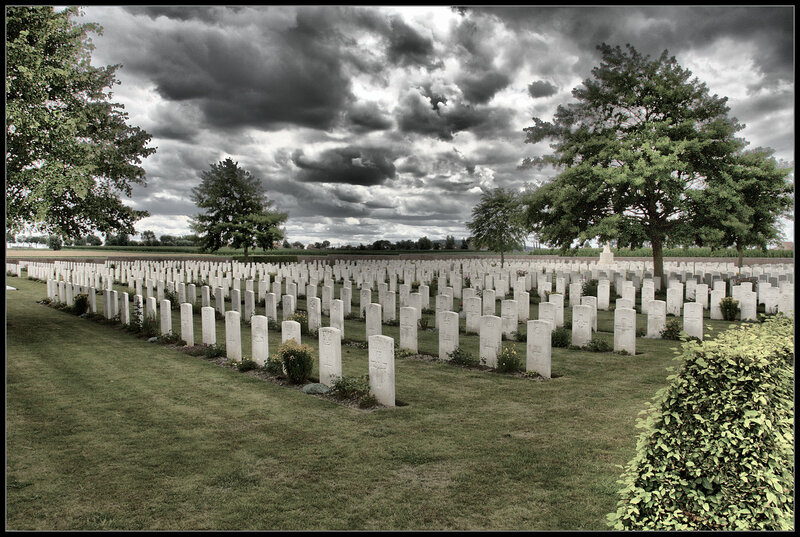 The cemetery is located in what was No-Mans-Land on 1st July 1916, between the British and the German Front Lines. 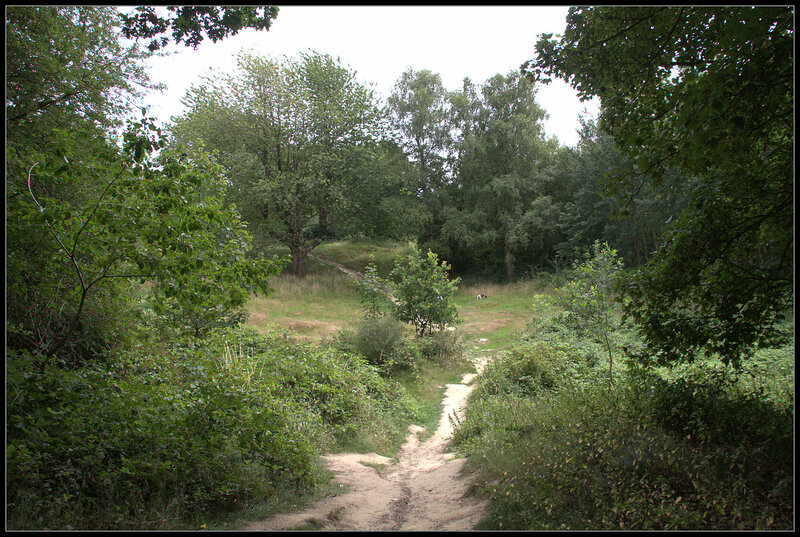 The Front Lines were situated on a ridge of high ground called the Auchonvillers Spur running in a south-easterly direction. A hawthorn tree was growing on this high ground and so the ridge became known as Hawthorn Ridge by the British Army when it moved in to occupy the Front Line here in August 1915. After walking around Beaumont-Hamel Newfoundland Memorial we thought we should actually go into the town of Albert and have a look around the town. At the same time we could check out the Basilica and the Museum Somme 1916 under it. Albert was the main town behind the lines for the Allies nearest to the 1916 Somme battlefields. It lies on the main D929 road that runs east to Bapaume across the Somme battlefields, and west to Amiens in the other direction (although the D929 now diverts to the south around Albert, the original road still runs through it). We managed to jag a park right opposite the Basilica and this guy was standing there, Australians are quite prominent around Albert. Onto the Museum Somme 1916. The Tommy outside the museum with some good looking dude. The Somme 1916 Museum in Albert occupies what was originally the crypt beneath the basilica, used as aircraft shelters in the world war 2. Alcoves show scenes of soldiers life. Unfortunately the light in museum wasn't that conducive to photo's. But we still got a few. Nice model of French Char Renault F17 light tank. Some Trench art. Soldiers made this in their spare time from whatever they had lying around. Cap badges and other stuff recovered from the battlefield. After the museum we wandered around and took a look into the Basilica. At the heart of the town, both then and now, is the Golden Madonna basilica. Before the war 'la Basilique' was a popular tourist attraction, with the golden figure of the Virgin Mary holding aloft the baby Jesus. Allegedly found by a shepherd in the middle ages the statue was credited with miraculous properties and consequently received many pilgrims. By the end of the nineteenth century Albert was so popular that Pope Leo XIII called it 'The Lourdes of the North'. In January 1915 German shelling toppled the statue perilously to an angle horizontal to the ground. However the statue did not fall. Superstitious legends sprang up on both allied and German sides. The British and French believed that the war would end of the day that the tower came crashing down; and the Germans believed that whomever caused the statue to fall would inevitably lose the war; both sides therefore took care not to aim shells at the tower holding the statue. This arrangement suited the allies since the tower provided a valuable vantage point from which to view the opposing German forces. After this we adjourned to a cafe across the road for a beer (wine for Jo) and a plate of cheese, cold meats etc. Quite civilised. After this little break we decided to head back to the hotel. But as we got there we figured we'd may as well check out the little cemetery behind the hotel. Although called Bapaume Post Military Cemetery it is actually on the outskirts of Albert, on the Albert to Bapaume road. 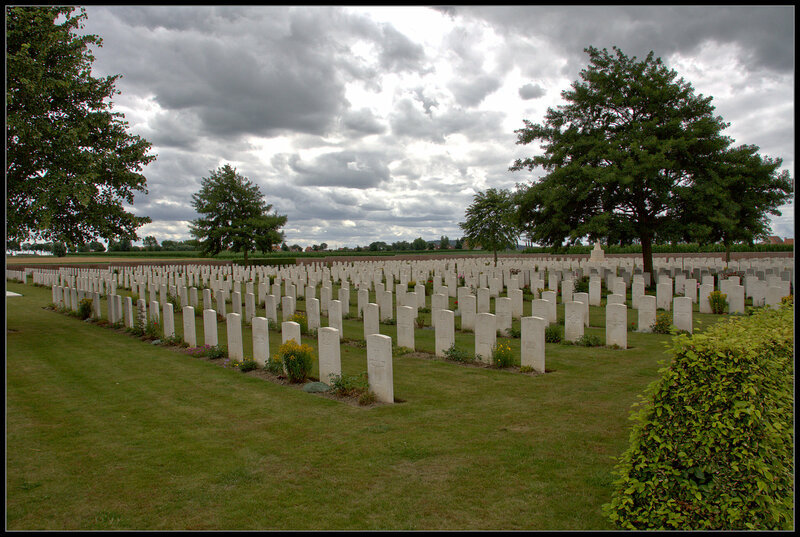 This cemetery is typical of the hundreds of little cemeteries that litter the landscape of the Somme and Belgium. quite emotional to look at, can only imagine what it is like to be there! We headed down the Albert to Bapaume road, towards Pozières. Just outside the town of Pozières, is the Pozières Memorial to the Missing of 1918. Pozières British Cemetery is enclosed within the boundary wall incorporating the Pozières Memorial to the Missing of 1918. Burials made during 1916, 1917 and 1918 are contained in Plot II and these were made at that time by the fighting units or field ambulances in position here near Pozières. All other graves were brought to this cemetery after the Armistice in November 1918. Most of the graves were brought here from battlefield burials in the vicinity of this cemetery. Most of these casualties were British and Commonwealth soldiers who were killed in the surrounding fields during the autumn battles of the 1916 Battle of the Somme. Some were casualties discovered in isolated burial plots and small cemeteries from the fighting in August 1918. We only admired this place from the outside as we wanted to get some km's under our belt. A view from the memorial looking towards Albert. That's the 1st Division Memorial on the left, where were yesterday. Next we headed through Pozières towards Bapaume. The NZ division fought around Bapaume in 1918. On the 24 August it took a lead role. We stopped at Grévillers British Cemetery. The village of Grevillers was occupied by Commonwealth troops on 14 March 1917 and in April and May, the 3rd, 29th and 3rd Australian Casualty Clearing Stations were posted nearby. They began the cemetery and continued to use it until March 1918, when Grevillers was lost to the German during their great advance. On the following 24 August, the New Zealand Division recaptured Grevillers and in September, the 34th, 49th and 56th Casualty Clearing Stations came to the village and used the cemetery again. After the Armistice, 200 graves were brought in from the battlefields to the south of the village. The French soldiers are marked with a cross. This is the marker used by the French in their Cemeteries for their soldiers. Looking down the centre of the cemetery toward the NZ Memorial. The Cross of Sacrifice in front of the memorial. Poppies on the side of road opposite the cemetery. My wife went to take photos of some and brushed some stinging nettle. Needless to say one of us found that funny, and one didn't. After a diversion, on the outskirts of Fromelles, to try and find a bunker that Adolf Hitler may (or may not) have been in during World War I we arrived at the Australian Memorial Park. The Battle of Fromelles in July 1916 is significant as the first occasion on which the First Australian Imperial Force (AIF) saw action on the Western Front. The battle is widely regarded as a disaster for the Allies, and has been described as "the worst 24 hours in Australia's entire history." It resulted from a plan to divert German attention from the Battle of the Somme, but historians estimate that 5,500 Australians and 2,000 British troops were killed or wounded. There are the remains of several German Blockhouses in the park. The land has grown up around some of these. They were protected with machine guns and much barbed wire. At the Australian Memorial Park is a statue called ‘Cobbers’. It shows Sergeant Simon Fraser, 58th Battalion, carrying in a wounded man on his back. Why ‘Cobbers’? That old Australian word for mate is little heard today, but in 1916 Fraser used it in a letter describing his rescue of two men: ‘Then another man about 30 yards out sang out, “Don’t forget me, cobber”. I went in and got four volunteers with stretchers, and we got both men in safely’. 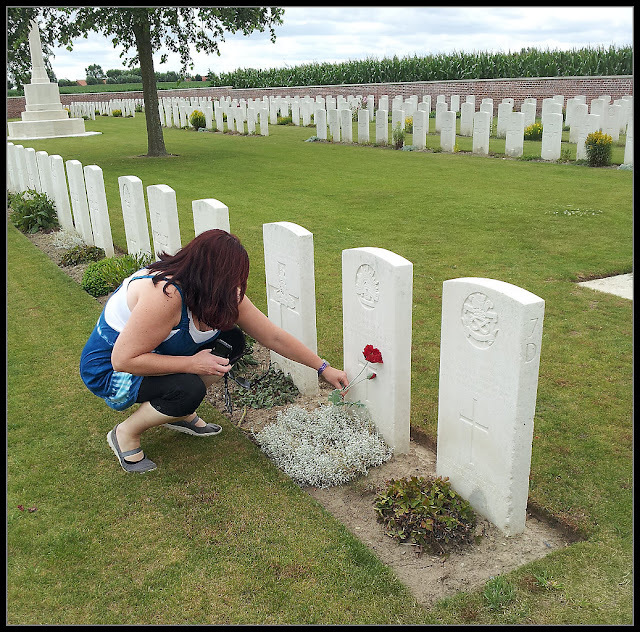 So it is not the memory of the military disaster of Fromelles which is remembered here, but rather the courage and compassion of those who risked their lives to help the wounded. About 200 metres down the road is V.C. Corner Cemetery. The trees in the distance in the image below are in the Cemetery. The memorial wall commemorating by name 1,299 Australians who died in the Battle of Fromelles and who have no known grave. II Anzac Corps comprising of the 3rd Australian Australian and New Zealand Division along with various British division fought in the Battle of Messines. The objective was to capture the ridge as a prelude to further attacks in the Ypres Salient. In the II Anzac Corps area, the 3rd Australian Division consolidated the southern defensive flank of the attack, digging-in astride the river Douve with its right in the new craters at Trench 122, defeating several hasty German counter-attacks; the left flank of the division was anchored by a captured German strong-point. The New Zealand Division attacked Messines village, the southern bastion of the German defences on the ridge. 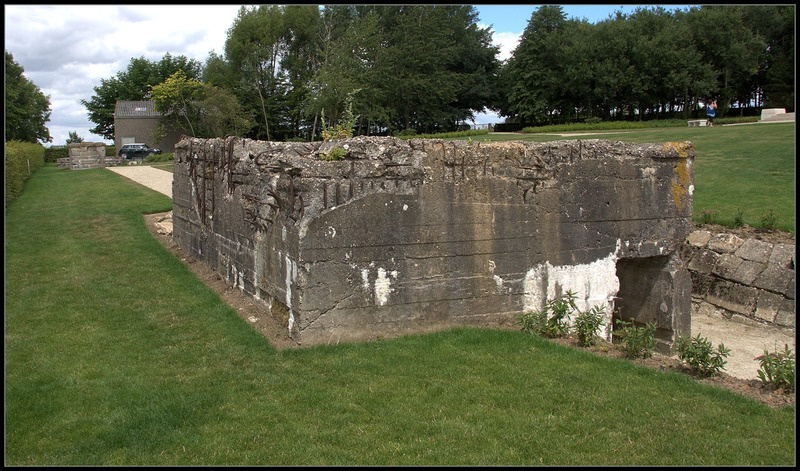 The village had been fortified with a line of trenches around the outskirts and an inner defence zone of five pillboxes and all the house cellars, which had been converted into shell-proof dug-outs. Two machine-gun posts on the edge of the village were rushed, but fire from Swayne's Farm 400 yards (370 m) north held up the advance until a tank drove through it and caused 30 German troops to surrender. The start line for the New Zealand Division was at the bottom of the valley. Around the far side of the ploughed field. In the memorial are the remains of two blockhouses/pill boxes. These were typical German defensive structures. You can see how impregnable to artillery they were. 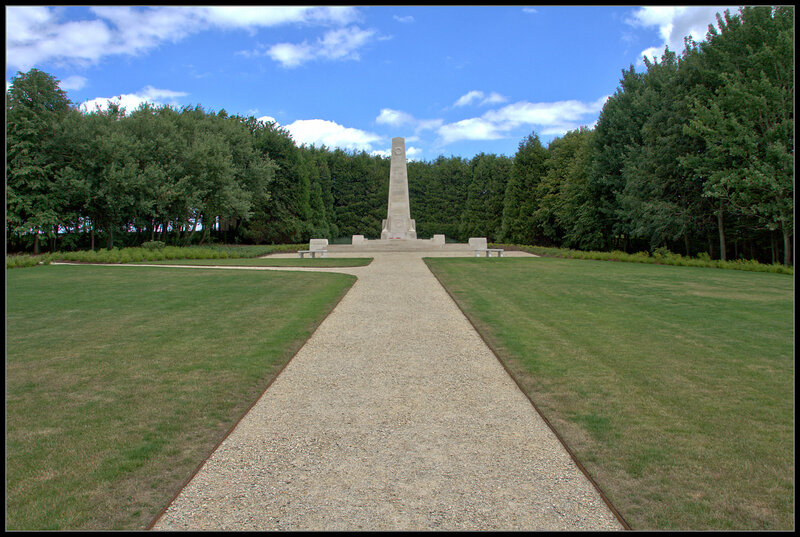 Adjacent to the New Zealand Memorial is the Messines Ridge British Cemetery. There are now 1,531 Commonwealth servicemen of the First World War buried or commemorated in the cemetery. We didn't actually go for a walk around this one as we wanted to move on. Our next stop was the The Huts Cemetery. This one is a little of the beaten track, only a little mind you. 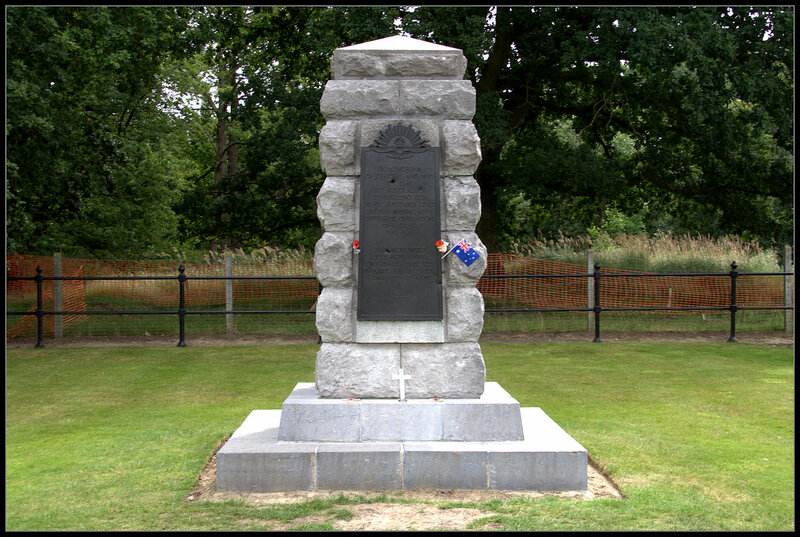 It's on 6 Kkms south-west of Ieper (Ypres) town centre. This cemetery takes its name from a line of huts strung along the road from Dickebusch (now Dikkebus) to Brandhoek, which were used by field ambulances during the 1917 Allied offensive on this front. Plots I to X and XII to XIV were filled between July and November 1917. Plots XV and XI followed. Nearly two-thirds of the burials are of gunners as many artillery positions existed nearby. The cemetery was closed in April 1918 when the German advance (the Battle of the Lys) brought the front line very close. The advance was finally halted on the eastern side of the village, following fierce fighting at Dickebusch Lake, on 8 May. There are now 1,094 Commonwealth burials of the First World War in the cemetery. We were going here because earlier in the year, as part of buy a poppy week a work colleague of my wife's, Ann, had purchased poppy to commemorate a Australian soldier who had died in world War I. 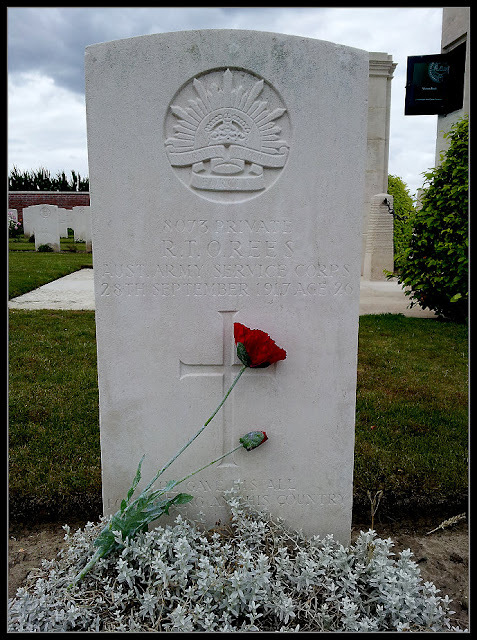 The soldier, Ann's poppy was for was Private R.T.O Rees, Australian Army Service Corps. He died on the 28 September 1917, aged 26. 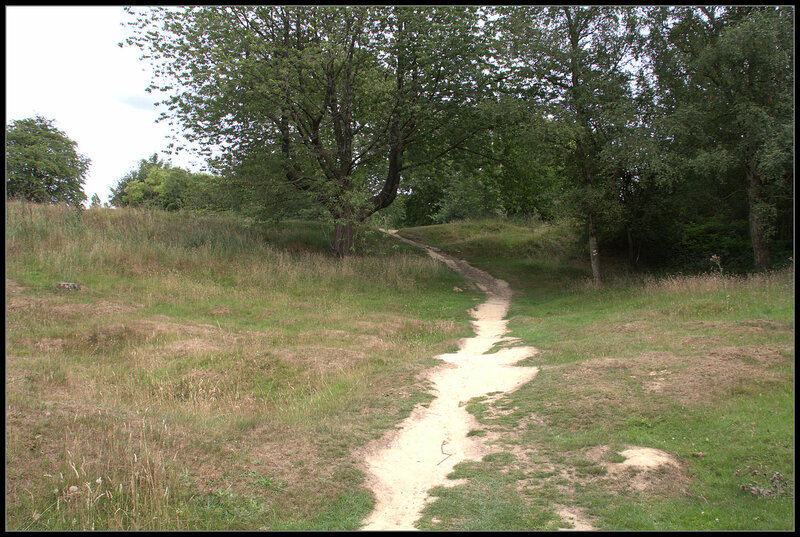 Hill 60’s prominence, in this relatively low–lying region, made it an objective of both armies and it was continually fought over from late 1914. Underground mining began in early 1915 as British miners tunnelled towards the German lines using the ‘clay kicking’ method. On 9 November 1916, the 1st Australian Tunnelling Company took over the Hill 60 mineshafts. By then deep shafts ran out metres under the German lines where they had been filled with high–explosive ammonal and sealed. Electric detonator cable ran along the sealed galleries to the explosives and it was the job of the incoming Australian miners to ensure that the enemy did not discover the mines or cut the detonator cable. The defensive underground shafts and galleries sunk by these ‘Digger’ miners had a real Australian flavour from the names bestowed on them – Melbourne, Sydney, Adelaide, Perth, Hobart, Newcastle and Brisbane. The protection of the great mine was part of the preparations for the major British ‘Flanders Offensive’ planned for the second half of 1917 around Ypres. Hill 60 marked the northern extremity of a German bulge or ‘salient’ into the British lines running from here, through St Eloi and Petit Bois, to Ploegsteert Wood south of Mesen (Messines). It was to straighten this line, in the lead–up to the larger operation planned to open in late July 1917 towards the east of Ypres, that the Battle of Messines was fought on 7 June 1917. At the opening of this battle, at 3.10 am, 19 great mines, at various locations along the salient line, were exploded. These, like the mine at Hill 60, had been excavated under the German positions in the year leading up to the Messines attack. 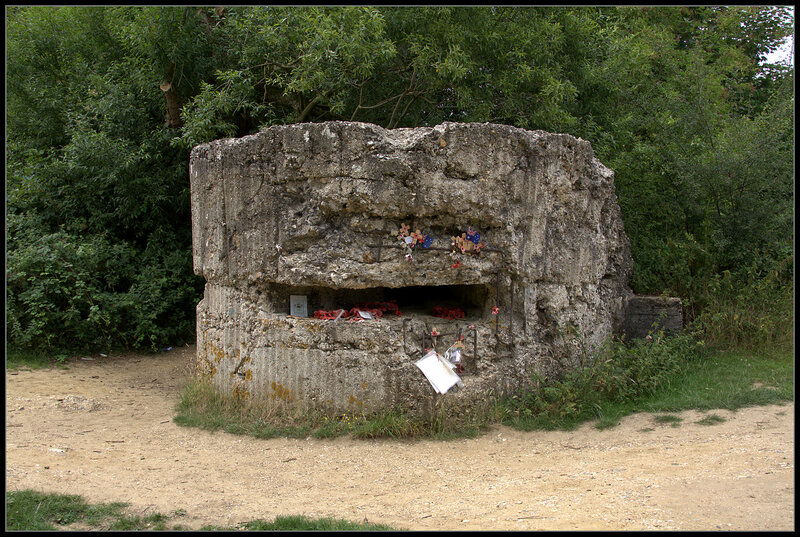 For the seven months before the blowing of the Hill 60 mine it fell to the Australians to ensure that the Germans did not find it. When we visited the site was under some major work. It is one of the most visited sites in the Ypres Salient. 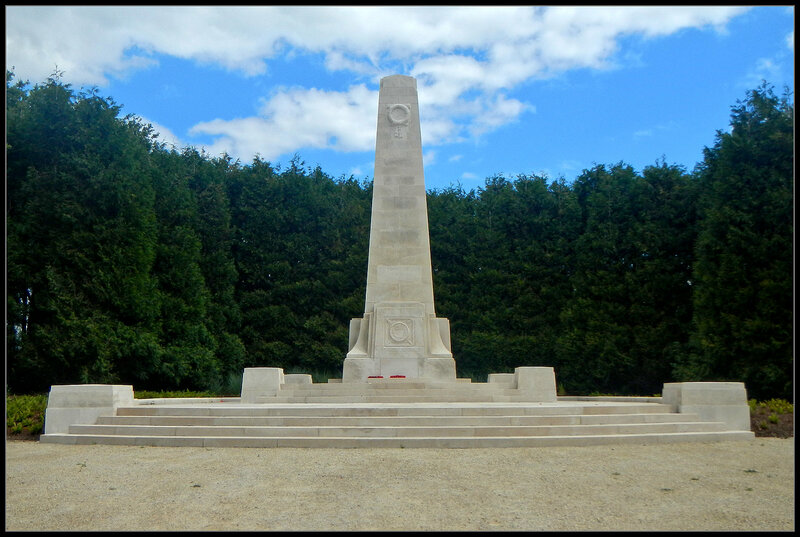 This is the Memorial to the 1st Australian Tunnelling Company, Hill 60. I don't know what this is though. All over the site are the remains of German strong points destroyed or buried when the mines went of. This one was particularly impressive. Without Tanks structures like these would be difficult to attack. Looking down into the main crater. View from the bottom of crater looking out. There are other memorials on this site. 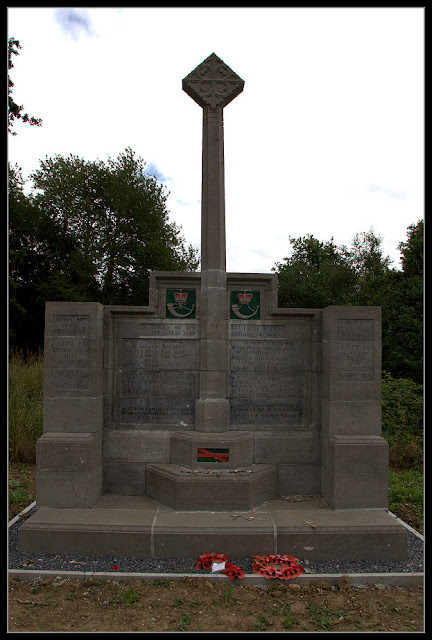 This one is the 14th (Light) Division Memorial.